Thanks to all past and current wing drivers, owners and enthusiasts. Bob Switzer, Danny Leger, Ted Boyd, Rick Connely, Rich and Daren Luhrs and Bob Valachovic just to name a few. built in 8 days flat, and went on to win the Winabago marathon. We kept on developing that concept of boat. I think 6 wood models in all were developed including the # 7000, and one just like it. 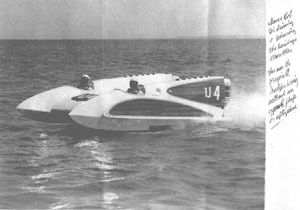 A year of so after we sold the U-4 to a guy out in Ca. it was returned for some repair work. his wooden hull with a glass hull. He agreed, that was the beginning of the first 18ft. Switzer Hydro Cat, soon to be renamed the Switzer Wing. As I said, we built a few of them and they were doing so good that Mr. Kiekahafer, wanted to control of who they were being sold to. He offered to purchase the molds in exchange for an initial order for 30 boats. So, I figured, we must have made about 10 before we sold the molds to Mercury, hence 40 18's in all. Now, we were being asked to supply the OMC camp with Wings, and we couldn't, because of our deal. So we developed the 20 footer, and I will be the first to admit it was probably years ahead of it's time. We used a wing foil that was good for higher speeds than the engines of that day were capable of. that boat with 3 motors clocked out at 102 mph and with the center engine removed, she hit 112 mph. Show's to go ya! how much a clean hull shape may mean more than just brute H.P. link to the Cat House pages with more Switzer info..
Mercury (Kiekhaefer) owned the rights to all 40 18 foot Switzer Wings produced. He did, in fact, have them in a warehouse....... but that cache is long gone. Back then after 2-3 years Mercury basically wrote off and destroyed all hulls in their possession...from hydros to Offshore hulls. The exceptions were those that Merc employees and friends were able to get out the back door...or buy outright. These 18 footers that are appearing here and there....including Gene Lanham's, John Sherlock's, and a few others are probably from that stash. Wing at a motorcycle dealership in Canada The Doyat Wing now owned by "Shadowcat"
Barry Cohen's Wing .. now gone..
Steve Cox's Wing The boat came from Ohio. Purchased from Jerry Book, before him the owner was Richard Clark. Known as the Valley Supply "Double Eagle"
Join the Switzer Craft owners group on Yahoo!! This website is dedicated to boat restorations and enthusiasts. If anyone has ideas, pictures or suggestions for us, please visit our forums.